This book was something of an oddity for me to pick up. 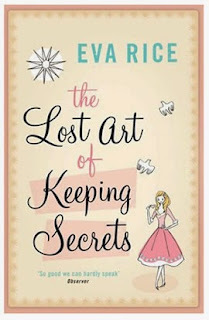 I knew that I had read The Lost Art of Keeping Secrets before, I knew that I had finished it in a matter of days and I knew that I had enjoyed it. Could I remember a bloody thing about it? Not on your life. And that really puzzled me. I know that I tend to have a better memory of things after I've written about them, but even so, to forget so completely what the book was like was a feat of some magnitude matched only by my patchy recollection of my dad reading The Hobbit to me when I was very young. I picked this up mainly to find out what on earth my memory was playing at. The Lost Art of Keeping Secrets follows Penelope Wallace, a young woman in the mid-1950s, as she tries to navigate her life with some semblance of decorum and just a little bit of daring. At home, she must contend with her pop-music obsessed younger brother and her incredibly beautiful and petulant widow of a mother on top of increasing debts that threaten to evict them from their ancestral home. But things start to change after she meets and, on a whim, decides to share a taxi with the chaotic Charlotte. She is in turn introduced to Charlotte's flamboyant aunt and her cousin Harry, who enlists Penelope's help in trying to win back the American woman he was previously wooing. I think there are two main reasons why this book failed to stand out in my head. First, it's very much a slice of life sort of book. I have nothing against this style of narrative, but I personally find them a bit difficult to keep straight in my head. With the majority of plots, there's a clear progression of events and tangents tend to be few and far between, so it's easy to keep them neat and segmented in my mind. Slice of life narratives tend to lack these a little, so the story becomes fuzzier and vaguer in my head as time goes on; I'll remember little bits, especially as I approached them in the narrative, but the whole picture is patchy at best. It also makes plot summary paragraphs really difficult to write, so thanks for that. The second reason that The Lost Art of Keeping Secrets was almost entirely forgotten was because it was, for lack of a better word, safe. There wasn't really anything that stood out as daring or exciting or really felt like it would have consequences. Instead it seemed to take place in a magical rose-tinted version of the 1950s, where youth and beauty is all you need to get ahead in life, where all the people that Penelope meets are utterly fabulous in some manner, and where all our aristocratic main leads aren't quite impoverished enough for surprisingly regular trips to Harrods to be out of the question. It has no real bite to it, but I don't think that this is necessarily a bad thing. I have used the term "popcorn book" before, and this is a prime example of that. It's not a book that you have to try particularly hard to read and can be perhaps inconsequential. It is a vital part of being a reader though, because it can get immensely tiring to always be reading intense, challenging books. And this one? As inconsequential as they come, but fun and charming enough that it doesn't matter at all when you're reading it.